Kevin Henkes gets kids. He knows what they think about, what they worry about, and how they act. And he’s able to express that on the page. He has some setbacks right from the start. He’s afraid his new teacher will think he doesn’t like her. So he comes up with a plan to make things right. But plans don’t always go smoothly. Other scenarios Billy deals with include making a diorama, dealing with his little sister, trying to stay up all night, and writing and reciting a poem. They’re child-size episodes and everything Billy does rings true. This book reminds me of the Clementine books, looking at life from a child’s perspective. Billy’s a little more worried about things than Clementine, but he also can’t hold still. He will win just as firm a place in children’s hearts. Atheneum Books for Young Readers, 2013. 64 pages. Our library is shelving this with nonfiction, and I think I’m going to list it there. Technically, this is a fictional story, but the book is more about facts than the story of the travelers featured. The story merely provides a frame for telling about steam travel across the country as it would have been in 1869, when the transcontinental railroad went all the way through. The charm of this book lies in the magnificent artwork. The book is a large square shape, with lots of room for details. Small train lovers as well as big train lovers will be delighted to pore over each page. The basic text tells a fairly simple story of a family traveling to meet their father and husband in California, addressing the reader, telling you what it would have been like. motion within motion, running down the track! the pride of her company and crew. Brian Floca uses font, size, and position on the page to make the words themselves part of the story, especially the sound effects. On this page, the words come closer and push the family back, as they gaze at the giant locomotive. The journey goes all the way across the country, and so many details are given. Pictures of landmarks decorate the pages, and we see the different kinds of terrain, what the passengers are doing, and what the train workers are doing, from the boy who sells newspapers to the engineer. The extra large pages give the reader both panoramic vistas and extreme close-ups to things like the engine and the mighty wheels. The inside front cover tells about building the Transcontinental Railroad and the inside back cover tells about how steam power works in the locomotive. No space is wasted. This book is a train-loving kid’s dream come true. And it may create some train lovers as well. At last! It’s again time for Sonderling Sunday, that time of the week when I play with language by looking at the German translation of children’s books. What with Christmas and a vacation in California, it’s been more than a month since my last installment, so I’m happy to get back to it tonight. 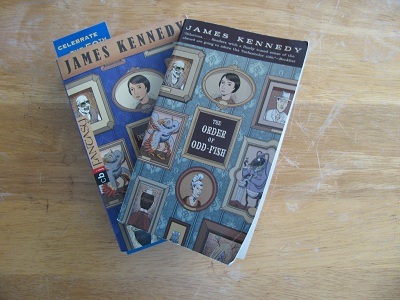 And after such a long time off, of course I’m coming back to my stand-by, Der Orden der Seltsamen Sonderlinge, The Order of Odd-Fish, by James Kennedy. = Wie aber war ist Ken Kiang ergangen? = Ken Kiang war überwältigt, er war übermannt. = Vollkommen verdattert und mit schwindelndem Kopf hatte er ihn verlassen. That’s it for tonight, finishing at the end of page 201, thus being so close to the halfway point of the book. And tomorrow morning, the Youth Media Awards are announced, including the Newbery and Caldecott Medals! There will be some wonderful schmetternde Fanfare for a situation that is Ehrfurcht einflößenden! Have a wonderful week! May you avoid both kläglichen Übermut and unvorstellbaren, riesigen Bösen! This strange and fateful tale is narrated by the ghost himself — who is, in fact, the ghost of Jakob Grimm, and someone who knows something about tales. I always said that I’m not particularly a fan of ghost stories. Yet 2013 may have changed my mind about that. It seems to have been a year for excellent ghost stories, each one having a flavor and plot all its own. In this story, there’s nothing sinister about the ghost. But there are definitely sinister forces endangering Jeremy, which the ghost tries to protect him from. Beautifully told. Source: This review is based on my own copy, which I got at ALA Annual Conference, and had signed by the author. Feiwel and Friends, New York, 2013. 86 pages. The problems in Bedtime Math are much better and more fun than the simply numerical problems I made up for my son. Each two-page spread has a fun scenario, followed by related math problems, one for “wee ones” (involving counting), one for “Little kids,” and one for “Big kids.” You can also get problems from their website or app. Wee ones: If you squirt 3 squirts of ketchup on a hot dog, and then 1 more squirt on your friend’s head, how many squirts did you fire off? Little kids: If you line up some burgers and squirt ketchup on the 1st burger, then every 3rd burger after that, which burger in the lineup is the 4th burger to get squirted? Big kids: If you squirt 2 cups of ketchup, and each cup used 14 tomatoes, how many tomatoes’ worth of ketchup did you just squirt? Bedtime Math’s goal is simple: to make math a fun part of kids’ everyday lives, not just something found only in homework assignments. Math should be as beloved as the bedtime story….We never hear people say “Ewww, a book at bedtime? !” Likewise, there’s absolutely no reason to say that about math. Numbers are beautiful, and kids love attention. Bedtime Math just puts the two together. With that, let the games begin. I’ve enjoyed all of Po Bronson’s books that I’ve read, most recently NurtureShock, which was also written with Ashley Merryman. I’ve been accused of being too competitive, and I recently joined a weekly board game group, so I was thinking about competition when this book became available. Po Bronson explores many different aspects of his topic, presenting studies done in any way related to competition. All of them are fascinating. Some of those things include how performance is affected by competition, what happens in our bodies when we compete, differences between men and women in competitions, family dynamics and competition (only children are less competitive — no surprise there! ), what happens when teams are involved, and how we respond to winning and losing. The part about the differences between men and women was especially interesting, except that I was annoyed that no data was given as to how prevalent these differences are. In other words, are all women as described, or just the majority? I’m curious if, as a competitive member of a large family, the qualities they attribute to women apply to me. Since I listened to it, I can’t quote great bits. I found it interesting that some people do better when competing — and some people do worse. I love playing games, but many of my friends don’t enjoy it at all. This book helped me see that probably has a lot to do with our genes and our upbringing, and not something either of us is likely to change in a hurry. In the section on teams, I thought it was interesting that teams do best not when everyone is equal, but when there are well-defined roles. I thought that related to recent plans to do away with some of the hierarchy at my workplace. It’s not necessarily a good idea. If you’re at all interested in any type of competition, this book is sure to cover some aspect of that type. Fascinating stuff. Oops! Announcing another 2013 Sonderbooks Stand-out! Here’s the deal. In all the years previously, I’d go back through my earlier posts before I chose my stand-outs and make a list of all the books I reviewed that year. But it got confusing on the years where I didn’t finish posting all the reviews of the previous year when that year started. So this year, I had a bright idea. I’d make a spreadsheet of every book I read from the beginning of 2013 onward. Then I used the spreadsheet list to choose my Stand-outs. So much easier! There was only one little problem. I forgot to write down some titles. So far, I’ve moved my total of books read up to 552 from the original 549 I posted. But the very worst oversight is the one I realized today. This morning I went to Capitol Choices, where we finalize our list for 2013. And I realized, to my horror, that I had not put Midwinterblood, by Marcus Sedgwick, on my list. How could I possibly have forgotten Midwinterblood? The only defense I have is that I read it very early in the year — and somehow I forgot to put it on my spreadsheet. As soon as I remembered it, there was no doubt in my mind that I have to put it on my list. This is super annoying, since I already numbered the lists. But Midwinterblood is the new #4 Sonderbooks Stand-out in Teen Fiction! And I’m going to be so careful in 2014 not to forget to write down any titles! You are currently browsing the Sonderbooks blog archives for January, 2014.